Misty cold water kayaking on The White River in Arkansas. If you are heading to SE Oklahoma to paddle the LMF or the Little River or for parasailing on the amazing Broken Bow Lake areas, K-River Campground on the Kiamichi River is a great add-on destination. The Kiamichi River has only one outfitter today, but I expect it to grow substantially as paddlers come to recognize what this backwoods river has to offer. Check out K-River Campground at Kriver.com for river conditions before you visit the Kiamichi River. The canoe livery operators there watch the conditions of several local paddling spots on the Kiamichi River. They will plan the perfect Oklahoma float trip for you. If you are looking for a paddling scene is free of rafts crowded with partying young folks, the Kiamichi River will take you there. This remote and rustic river winds through hills and forests untouched by economic development and rumor has it: there be yellow GOLD free for the panning! In addition to a knowledgeable outfitter, another great new thing that K-River Campground has to offer is wireless internet. We tried it out on our last visit to K-River Campground and it works pretty well! The Kiamichi River is best for paddling during the Spring and Fall rainy seasons. The river is remote and beautiful, so take your camera, take a PFD and take the time to let someone know where you are paddling and when you should return. For me, no year is complete without at least one trip down the Kiamichi. Now they are even doing a bit of Oklahoma gold panning on the Kiamichi River, ask Tom how you can learn this ancient method to make your fortune. Take a tent or RV to Kriver campground and spend a few days in the wilderness of Southeastern, Oklahoma. There are a number of other great canoe & kayak destinations nearby such as the LMF River in Broken Bow, Sardis Lake and the Little River. Despite weather forecasts of impending rain and thunderstorms, Dianne and I decided to head out to one of our favorite campgrounds in Southwestern, Oklahoma. K-River Campground on the Kiamichi River offers canoe & kayak rentals, shuttle service, cabins, tent camping and RV sites. You can find out all about the campground from the campground owner Tom Garrett's website: Kriver.com. In my trips to K-River Campground, it has always been quiet and secluded. I have never seen it crowded with rowdy youth like the Illinois River in Tahlequah, OK or the Elk River in Pineville, MO during the summer peak paddling season. For us, almost the entire drive is on Indian Nations turnpike, you have to pay some tolls, but it is very fast road. Take the Antlers exit off the turnpike and K-River campground is just a few miles north of Antlers on Hwy 2. See the maps on Tom's website KRiver.com. Spending the night in one of K-river's cabins has become something of a March tradition with Dianne and I. Spring weather makes me anxious to get on the water and Dianne prefers to focus more of her attention on the NCAA Basketball Tournament. The DishTV equipped cabins on the Kiamichi River at K-River campground provide the perfect compromise for March Float Trips. The WiFi internet access recently added makes the offer even more attractive. The Kiamichi River makes a welcome change from paddling Okmulgee's lakes and our float trips on the North Canadian River. Tom Garrett and his crew will outfit you and your group for paddling trips of almost any size from just a few hours to several days on the river. Water levels can change very fast on this part of the Kiamichi due to water releases from nearby Clayton Lake. Last year, we arrived to find the river nearly dry and the next more it was bank-to-bank and rolling! This weekend the water level was low, but good enough to paddle for several miles around the campground and some folks were getting shuttled upriver to 9-Mile creek and paddling down to the camp. This time we decided to paddle the waters just upstream and downstream from the campground. The deeper water holes are upstream from K-River Campground but there are more sights to see on the river paddling downstream from camp a short distance. Going upstream we occasionally stepped out of our kayaks to wade a few yards through the low water rapids. There was enough current to take us down these same low water rapids, but the water level was too low for me to paddle up them. Although the weather was rather warm and humid, we had NO problems with either mosquitoes or ticks. Strangely, we saw NO turtles or wading birds on the river. The water was quite clear and cold, and since upstream of Kriver camp is heading East and downstream is heading West there are ample opportunities for photography. Paddling downstream just a short ways will bring you to an old decayed railroad bridge that is excellent for composing into pictures. I must have taken 3 dozen shots of it on Saturday morning. I certainly need to return sometime for some sunset shots there. Paddling under the old railroad bridge and up the creek will bring you to the current highway bridge across Buck Creek. You can paddle quite a ways up this creek also. Of course, when the water level is low here as well, so you have to hop out and walk up the occasional gravel bar dragging your boat. However, this is a small price to pay for the fun of paddling back downstream again. I love the location of K-River campground, however their cabins are not exactly what you would normally expect. Our cabin was built from a storage building that had been converted to a retail store that had been converted to a cabin. In fact, it still has the "Basket Barn" sign on the front! Following the converted barn theme, we had lunch Saturday afternoon in Antlers at the "Burger Barn", also made from a converted storage building! Great burgers...we recommend The Big Buck Burger (it is actually made with beef despite the name)! The campground is run entirely by men and you can tell it from the details. Expect expert advice on river conditions, but do not expect a mint on your pillow. Even their finest Dish TV equipped cabins are rather Spartan and the water smells of sulphur. Bring your own dishes, linens, towels, washcloths, coffee cups, coffee, blankets, grill...basically everything. Cabins cost from $45 to $85 per night and they are well worth it for the awesome location right by the Kiamichi Riverside. The RV parking spots are wide and plentiful and many offer a fine river view. We were especially happy to find the WiFi internet up and easy to work with, in fact we used it to pay for our lodging via paypal minutes after arriving. The RV parking prices seem quite reasonable: 30 amp - $18 for 2 adults. $3 ea for extra adults 16 or over. Includes water and electric. $22 for 50 amp hookup. I think we may bring our toyhauler down here the next time we can get away for a week or so. Canoes - $30 per canoe for half day trip. Group canoe rate is $25 ea for 10 canoes or more. Kayaks - $20 per half day trip. $30 for full day or overnight. Tubing - $5 each - $20 minimum per group. There are a number of free running camp dogs that might be scary to very small children or folks unacquainted with country dogs. We didn't mind as Dianne and I have lived in the country our whole lives and we can tell the difference between country dogs and feral dogs. The biggest problem we saw? No cell phone signal. Sadly, I cannot sneak away to K-River on a Thursday and work as if I am working from home the rest of the week without cell phone signal. Just a couple of miles from camp is a nice general store in Moyers, Oklahoma and if you travel a bit further down the road you come to Antlers, Oklahoma. Antlers has a couple of motels, several restaurants and the usual small town businesses. Antlers currently has no Wal-Mart, a fact that no doubt saved us a fortune! We visited K-River Campground several summers, one Kiamichi River float trip report is below. You can read more about the fun we have paddling the Sooner State in our Oklahoma kayaking blog, see the pictures on Flickr . Whether it is the scenic canoeing in the summer when water levels are low or the nasty rapids to shoot in the rainy seasons, the Kiamichi River has paddling for river runners of all skill levels. Although very remote, the Kiamichi River can be reached pretty quickly from most of Oklahoma by taking the Indian Nations Turnpike to the Antlers, OK Exit and then driving the short distance to Moyers, Oklahoma. This part of Southeastern Oklahoma is well blessed with great paddling water. The gorgeous and somewhat challenging Mountain Fork River, and the more technical Glover River, flow nearby offering additional paddlesport opportunities for visitors. Treat the Kiamichi River with respect as it is a stream that can be tame at lower water and a raging torrent at high water. Click here for current river water level and flow in Kiamichi river. Look for a current flow of at least 50 or expect to do a whole lot of dragging...boat dragging that is! Dianne and I had lots of fun and a little bit of trouble on our trip down the Kiamichi. First, the fun part! After renting a decent Coleman canoe with comfy backrests (we probably should have chosen the kayaks) from K-River Campgrounds, we were driven to a Highway Bridge several miles up the road. The put-in for this float trip was the most exciting I have ever experienced. While the outfitter held our canoe precariously perched over the highway bridge railing, Dianne and I hopped aboard and held on tightly as he let us plummet down the grassy side of the highway bridge embankment in our little red canoe. Although I hoped it was seaworthy, I never would have guessed that it was grass-worthy! 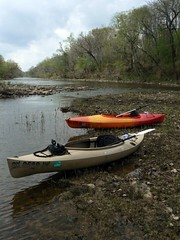 After that exhilarating start, we began paddling down a small creek that feeds the Kiamichi River. At the confluence we got a little bit confused by the extremely slow water and managed to paddle upstream for about 30 minutes before realizing and correcting our error! it is a good thing we figured it out, as we saw almost NO human life on this river. The owner / operator of the K-River Campground is a really nice guy and when you are this far in the backwoods ...that's real important! heck, he even offered my a big ol' glass of iced tea after we finished our paddling. The Kiamichi River was recently selected by The Nature Conservancy as one of the most critical watersheds in the U.S. for protecting biodiversity. This is based on its diverse and abundant aquatic fauna and the fact that the Kiamichi River is one of the few tributaries of the Red River that has not been significantly influenced by major land use changes or water diversion. The Kiamichi River contains a population of the federally listed Ouachita Rock Pocketbook Mussel (Arkansia wheeleri) and seven other vulnerable or imperiled mussel species including the recently re-discovered Scaleshell mussel (Leptodea leptodon). Thankfully, there is a plan to save these mussels! Can You Find Gold in Oklahoma? Gold has been found recently on the Kiamichi River mining at K-River Campground. Placer gold can still be found in the creeks Southern Oklahoma. Around 1890, Oklahoma prospectors found old Spanish mines and evidence of considerable gold, silver, and copper mining. There are reports of gold finds ranging in location from the Great Salt Plains in the western part of Oklahoma to the forks of the North and South Canadian rivers near Eufaula.